If you are thinking of walking in the Pendle area, or maybe even just want to view the fantastic scenery, then this CD / DVD book combination is for you. 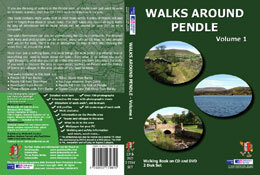 This book contains eight walks that all start from within 4 miles of Pendle Hill and vary in length from three to seven miles. The DVD takes you round all eight walks by way of slideshows set to music which can be viewed on your TV or on a multimedia computer. The walks themselves can also be viewed using the CD on a computer. The detailed walk texts and photographs can be printed, along with an OS map, to take around with you on the walk. There is also an interactive OS map of each one, showing the views from all around the walk. More than just a walking book, this book brings the walk to life and informs you of everything you need to know about the walk - from what to do before you start, right through to what else you can do in the area once you have completed the walk. If you want to discover the area in more detail, sections on Pendle and the history of towns and villages in the area provide all you need to know. The CD itself includes: Detailed walk text; over 750 photographs; interactive OS maps with photographic views; slideshows of each walk; walk statistics and hill profiles; history and geology of the area; towns and villages in the area; what to do in the area; wallpaper and screensavers for your PC and much, much more.